To me the triangular pieces wrapped in mulberry paper are basic units of information, the basic cells of a life that only exists in art, as well as in individual social events or historical facts. By attaching these pieces one by one to a two-dimensional surface, I wanted to express how basic units of information can create both harmony and conflict. Born in Korea in 1944, Chun had a notable career as a painter before developing his signature paper-packet technique in the 1990s. There is an element of nostalgia in his medium. In his youth, Korean druggists packaged medications in recycled paper bundles similar to these. In this case it is not the contents but the wrappers—and their arrangement— that are important. 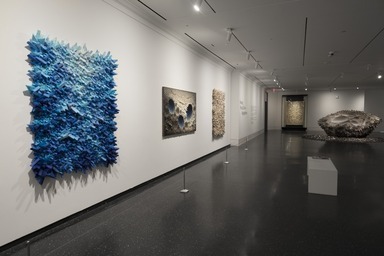 The artist chooses his paper carefully, using pages from older, scholarly books printed on the prized Korean mulberry-pulp paper called hanji. Some of the text is in the Korean script Hangul; much is in the Chinese characters once used in Korea for more formal or academic writing. The writings of Eastern philosophy are randomly reconstructed along the boundaries where folded pages meet . . . a page from the Analects [or Sayings] of Confucius, for example, can attain an entirely different meaning that is opposed to the original idea of the book. Chun compares the way we see fragmentary passages of text on the sides of packets to the somewhat random way that people process their world. “Every piece of information . . . is in ceaseless conflict with another, until one of them finally becomes accepted as fact, as new knowledge.” Learning, for him, is another form of aggregation. 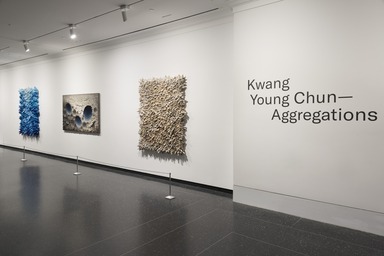 Kwang Young Chun: Aggregations is curated by Joan Cummins, Lisa and Bernard Selz Senior Curator, Asian Art, Brooklyn Museum, with special thanks to Sunny Shin. 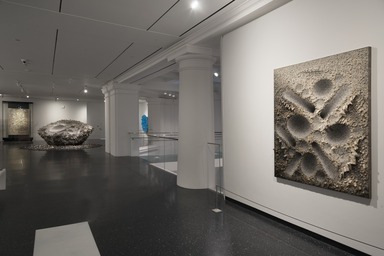 This exhibition is made possible through the generous support of Young Hwan Jeong. Additional support is provided by The Korea Society. 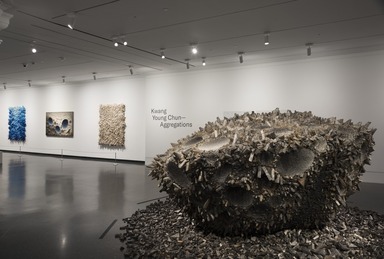 All of the objects in this space represent traditions of reading, writing, and paper-making that played central roles in Korean culture for more than 1,000 years. The pieces shown here range in date from the twelfth to the twentieth century. 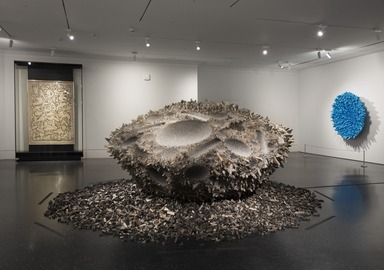 They were selected to complement the installation of Kwang Young Chun’s Aggregations, displayed in the adjacent space from November 2018 to July 2019. Writing has long been important in Korean culture, not simply as a means of communication but as an art form. Around the fifth century, Koreans began to adopt Chinese characters (known in Korean as Hanja) as their primary writing system. Then in the fifteenth century, King Sejon of the Joseon dynasty implemented a new script, called Hangul, that was created specifically for the Korean language. Hanja remained popular among the Korean elite because of its associations with higher learning. It is still taught in some Korean schools although it is no longer used in most modern communications. Koreans cultivated a taste for beautifully and expressively written calligraphy, and several of the objects on display in this room use words as part of their decoration. Others were made as desk accessories, necessary implements for those who wrote with a brush and ink. Still other pieces relate to historic and religious texts. The modern collages by Lee Ungno are made from old magazines and from the Korean paper known as hanji. Several of them draw inspiration from Chinese and Korean word forms. Lee Ungno was born in Korea in 1904 and died in Paris in 1989. He spent the first half of his career as a celebrated practitioner and teacher of traditional Korean ink painting. At the age of 56 he moved to Paris to found the Academy of Oriental Painting. 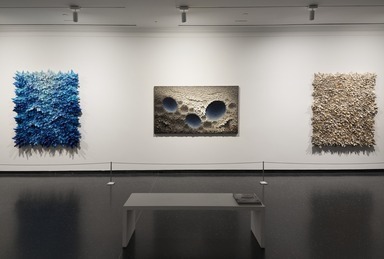 Although he continued to teach ink painting, immediately upon arriving in Europe he began to experiment with new materials and approaches to art-making and these investigations would continue through the second half of his career. For his first Paris gallery show in 1962 Lee created collages made of found magazine paper that he tore and crumpled to create complex surfaces that looked a little like heavily built-up oil paint. Soon thereafter, he started incorporating shapes that recalled East Asian calligraphy. His first calligraphic pieces blur or partially obliterate shapes drawn from China’s earliest writing systems. Later he invented simplified forms that were inspired by Korean script (Hangul) but were also somewhat figural. He developed a “vocabulary” of these abstract shapes that he continued to use for almost thirty years. While incorporating the written word into works of art was considered a Modernist trope in Europe, in East Asia it was a centuries-old tradition, one that is celebrated in the ancient and historic objects on display in this gallery. For decades, Lee Ungno’s career was overshadowed by scandal in his homeland: in 1967, Lee was one of several intellectuals living abroad who were charged with espionage by South Korea’s intensely anti-communist government. He served two years of what would have been a life sentence before managing to gain release and return to Paris. His reputation has only recently been restored, and in 2007 a museum was founded in Seoul to celebrate his long career and diverse contributions.